You can find Steven’s lists from prior years here: 2017, 2016, 2015 2014, 2013, 2012, 2011, 2010, 2009. I watched 176 TV shows (+66 vs 2016), 41 movies (-13 vs 2016), and read 4 books (-3 vs 2016). 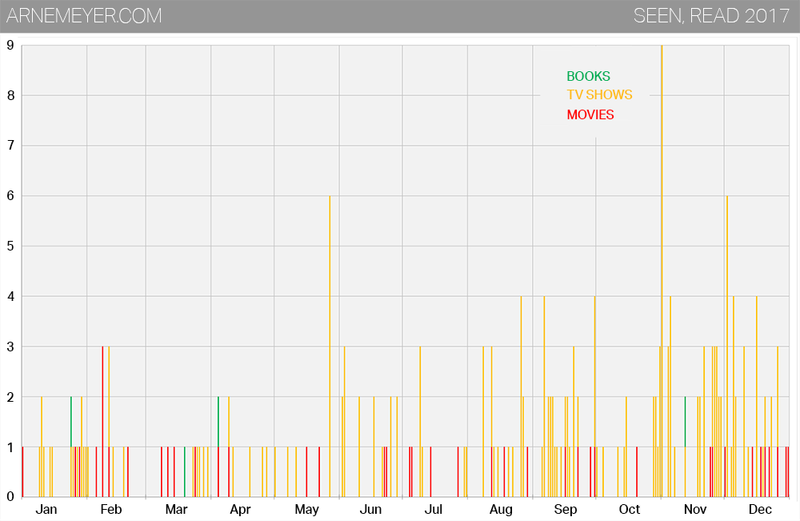 My busiest day was on November 1, when I watched 9 episodes of Homeland in one day. I didn’t manage to wach more than 3 movies in one day — on February 8. It shouldn’t come as a surprise that was on my flight from London to Los Angeles. I watched The Intervention, Doctor Strange, and Denial.